Put your own unique personalized stamp on your wedding or party favours with the help of customized wedding favour stickers from Weddingstar. 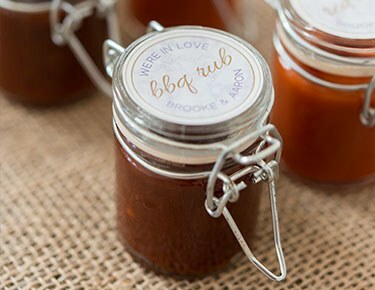 Whatever personalized sticker labels you need, we have what you're looking for in our one-stop wedding personalization shop! Use your imagination with these high-quality personalized favour stickers. You can find decorative shapes for personalized wine labels, souvenir personalized CDs, wedding favours such as gift boxes or gift bags, custom designed playing cards and more. Are you planning a tropical, seaside or beach wedding theme? Choose our starfish stickers! Wedding favour bags adorned with these charming sea creatures will evoke the magic of ocean life. How about a wedding sticker for cars and other vehicles in the wedding party? 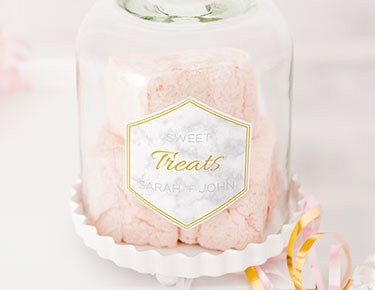 These premium favour stickers will help you add a unique touch to all of your wedding favours, props and accessories. The sky is the limit! 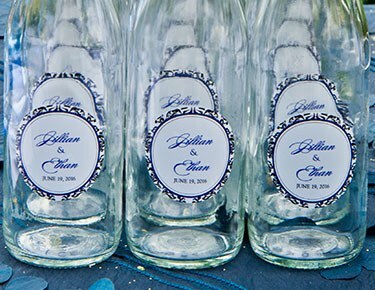 Turn your average everyday water bottles, preserve jars or wine bottles into special keepsakes for your guests. Our 2- or 1.5-inch round stickers are ideal for adding to bottles, bags and more. Use them to adorn bags of candies or chocolates, cookie tins, potpourri sacks and many other wedding favour gifts. Choose from designs that will match your wedding's style, colours, seasonal design or motifs. Our customized round stickers are printed in brilliant colours and fonts and are guaranteed to not disappoint. Rectangular custom stickers are also ideal for bottles of wine and food samplers, and they can be effectively used on wedding place cards and on small table signs. 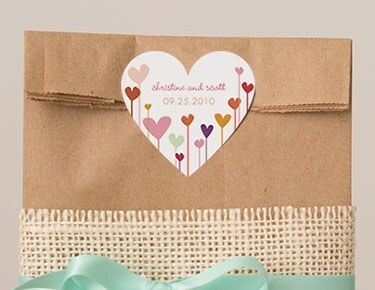 Add a touch of romance with the help of our personalized heart-shaped stickers. Decorate many items and accessories to automatically add flair and special charm. Our unique-shaped stickers are cut in a variety of shapes and patterns with decorative edging details. Choose from die-cut stickers, personalized themes and interest stickers, designs and colours. You're sure to find the unique-shaped personalized stickers that you'll love. For those who love all things vintage, choose our Vintage Travel Hot Air Balloon, Vintage Travel Airplane, Antique Chic or the Parisian Love Letter sticker. 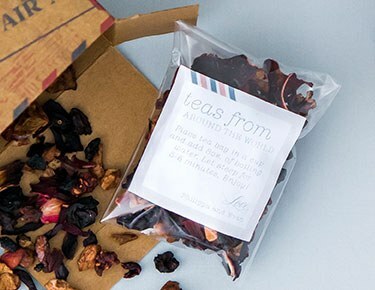 Your thoughtful, personalized giveaway will reflect the uniqueness of your day! Add a fun spin on playing cards with our playing card stickers. You can't go wrong with personalized favour stickers to add playful fun, festivity and customized details to your wedding favours.